NetbookNews has turned up Sharp's latest tablet in Taiwan. It's a dual boot system running Windows 8 and Android 4.0 Ice Cream Sandwich on Intel's Medfield chipset. 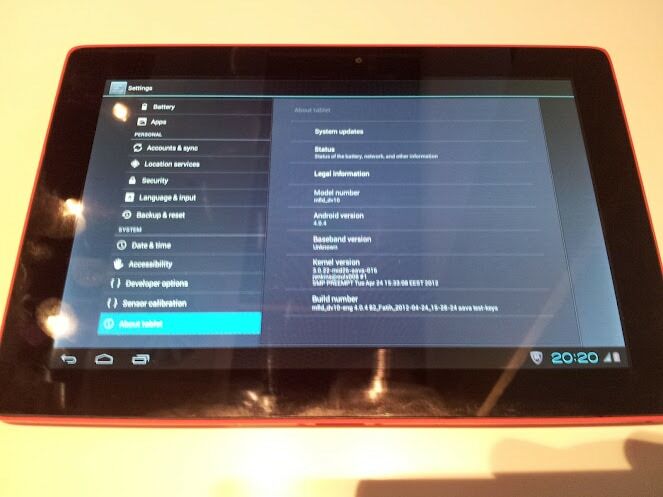 The tablet is just a prototype, but it looks more than a little interesting to me. I don't see any info on the specific CPU, but NN does mention that this tablet has a 6 point capacitive touchscreen with a screen resolution of 1280x800. It has 32GB of Flash storage, 2 cameras (8MP and VGA), a pair of microphones and speakers, and optional 3G. It also has a whole bevy of ports including SD, HDMI, USB, and more. Battery life is reported to be 12 hours, but as we all know that is very likely a tad optimistic. This tablet is also going to have optional features which clearly show that this is heading for the academic market, including a biometric sensor, RFID based alarms, pen input, and wireless charging. That last will be deeply appreciated by most any school district; tablets are commonly stored on carts (1 to a room). It would make a teacher's job so much easier if the tablets could simply be set down to charge without having to plug it in. There’s only two versions of Medfield right now. The Z2460 is what’s being used in Smart Phones, and is clocked at 1.3GHz with up to 1.6GHz Burst Mode. While the Z2560 is what’s primarily targeted for tablets, and is clocked slightly faster at 1.6GHz. Though Burst Mode value is unknown. The 12 hour run time is optimistic even by ARM standards but Medfield’s power consumption is in the same range. So should be at least as good as a comparable Cortex A9 tablet with similar configuration.